ClickBank is one of the popular secure online retail outlet that market more than 70,000 digital product vendors and has over 100,000 active affiliate marketers. It make a sale transaction almost in every three seconds! They can easily process more than 27,000 digital transactions a day. ClickBank is privately held with offices in Broomfield, Colorado and Boise, Idaho. Click Sales Inc. is a subsidiary of Keynetics Inc. The affiliate marketers promote the ClickBank products and earn a commission by doing so. The vendor can afford to gave a such high payout because it was product in digital form i.e e-book. No physical delivery or posting is required in this case. Customer receive their e-book via e-mail. For promoting physical product i.e Amazon, affiliate marketers only get about 4%-10% of the selling price due to high delivery cost. In fact, affiliate marketing is one of the best way to earn money online! In Malaysia, the only option for affiliate marketers to get paid is via Check(unless you are a Super Affiliate). The check will arrive in your mail box about two weeks. The latest Check for the period 18/8/2010 till 1/9/2010 was paid(send) on 15/9/2010 and safely reached my address on 29/10/2010 via snail mail. The check is in US Dollar currency and only valid for 90 days for you to cash it. You get paid once every two weeks. There is No direct deposit of commission since Malaysia was not in the list on International Direct Deposit (XACH). ** For security reasons, an account must have first received two paper paychecks before it is eligible to enroll in XACH. * I highly recommend that you sign up for direct deposit if your country is in the above list. Payment Threshold is a predetermined minimum amount of money you must have in your account before ClickBank cut you a check. The minimum Payment Threshold is start from $10. This mean you can get the ClickBank to send you Check once your commission reached $10. It’s no advisable to set your Payment Threshold that low as the service charges of clearing the check can eat up a huge amount of your pay check. You also must fulfill a Customer Distribution Requirement, which states your account must reflect sales made with 5 or more different credit card numbers, and the sales must have been made with two different payment methods (either Visa, MasterCard, or PayPal). Note: PayPal purchases do not count toward the minimum 5 different credit card numbers. Payment = [(previous balance) + credits – debits + allowance release] – return allowance*. * No Return Allowance is held on payments that total $25 or less. * The standard Return Allowance is 10%. However, this percentage may be raised to 20%, 50%, or 100% if our Security Department associates your account with high-risk activity. 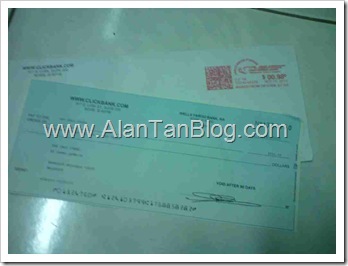 For check payment, there is a Pay period processing charge of $2.50 for every check issued. Since the snail mail is not 100% reliable and the pay check mail can get lost. In this case, you may request ClickBank to send you a new check. To issue a new check, ClickBank have to pay a service fee to the bank network to recall (void) the first check. A US$20 cancellation charge applies and is deducted from the amount of the newly reissued check. New checks will only be issued on days when regular checks are sent. ClickBank must receive the reissue request by the pay period end date in order for the reissue check to be processed at the same time as the payment for that pay period. Once you do sales in ClickBank affiliate, you must active and keep making sales. This is to avoid been classified as a dormant account. Dormant accounts are subject to a charge of $1 per pay period after 90 days of no earnings, $5 per pay period after 180 days of no earnings, and $50 per pay period after 365 days of no earnings. Your dormant account with positive balance can become zero in no time! Clearing the check with local banks can takes from 3 weeks to 10 weeks and the clearing fee cost range from RM20-RM60. This entry was posted on Friday, October 1st, 2010 at 10:58 am	and is filed under Make Money. You can follow any responses to this entry through the RSS 2.0 feed. Both comments and pings are currently closed.